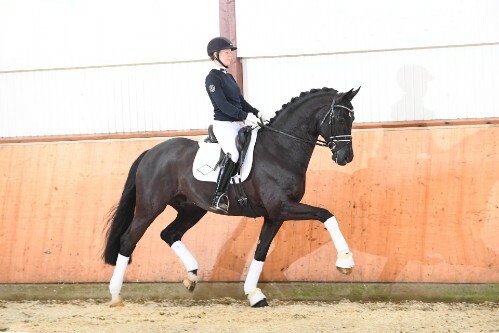 Movement strong premium stallion of the Verden licensing 2014, dressage winner of his 30-day test, Hanoverian champion 2016 and two times vice-Bundeschampion in Warendorf! "Bon Coeur" - literally translated "good heart"! With his heart in the right place, this extremely talented black horse can easily meet, perhaps even surpass, the expectations placed under the saddle. Due to his seemingly unlimited elasticity, constantly powerful and at the same time light hooved, this young stallion knows how to present himself in the best light. Thus, our "Benni" passed the high-caliber field in his 30-day test in Schlieckau and won the dressage test with a final score of 9.1 and a remarkable breeding value of 150 index points. The dream score 10.0 was shown several times. That this grading was no coincidence, he could then put on the discarded sports exams, here his performance was again rewarded with highest marks over 9.0. 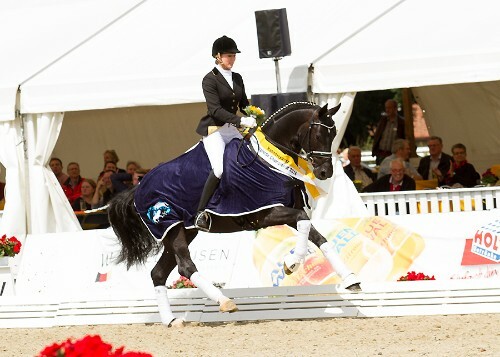 After multiple victories in riding horse tests followed the title of Hanoverian champion. As a double vice-championship winner, Bon Coeur managed to win his first dressage test class L straight away last year. 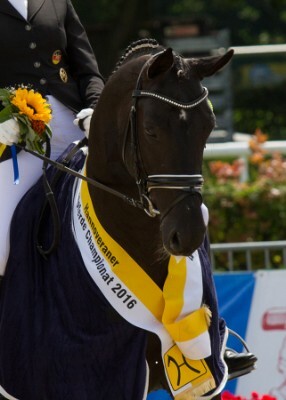 So he was qualified for the Bundeschampionat in Warendorf with his parade 9.0 for the third year in a row. The fascination of Bon Coeur and his brilliant talent for movement are based on the best dressage genes: his father Benetton Dream was Bundeschampion of three-year old stallions, 5 and 6 years old qualified for the Bundeschampionat, 7 years old already S-victorious and 8 years old participant of the Nürnberger Burgpokal , Decorated with several Grand Prix victories, he then moved to Sweden to Tinne Vilhelmson Silvfén to Sweden, where he currently belongs with his breeding value to the absolute elite. Also in this pedigree, dam sire Sandro Hit impresses with his own athletic performance (national champion and world champion of 6-year-old dressage horses) as well as his first class performance (federal champion, dressage world champion, licensing winner, offspring with world cup successes and Grand Prix victorious). In the third generation on the performance blood of the Carismo (at that time test winner) v. Calypso II secured, which led in the tribe of Lusitania several times to internationally winning offspring in both branches of tournament sport. Thus, with our Bon Coeur, a large part of his considerable power in the back and the always active hind leg results from the interesting connection to these valuable jumping genes. "Bon Coeur" - due to his success-spoiled career and the excellent potential foal year, it is already impossible to imagine the dressage parquet without him. Our special anticipation applies to the first, top-class Körjahrgang in the coming fall.